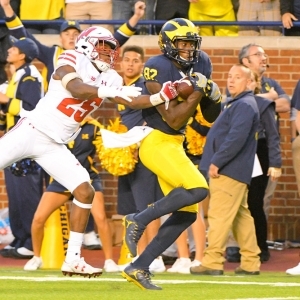 Undefeated teams fell in bulk on Saturday, but nothing at all changed for unbeaten Michigan. Before Saturday's game at Michigan State they controlled their own destiny - keep winning and they are a playoff team. They won, and they are still assured of a playoff spot as long as they keep on rolling. It wasn't as stylish a win as might have been ideal, but they beat up a rival they have been cursed against lately, and that's all that matters. And they stayed healthy - a crucial thing as the season ages. So, the story here is the same as it has been all along for them. They need to focus on this opponent, beat them, and march towards that showdown at Ohio State on Thanksgiving weekend that will quite likely decide at least the division and potentially much, much more. For Maryland, the stakes here aren't nearly as high. It's all about pride here - they can play spoiler in a really big way. That's really it - they basically can't win the division. A win would also make them bowl eligible, but with Rutgers on the schedule in the closing week, bowl eligibility is a lock anyway. One guy who isn't going to lack motivation here is Maryland head coach D.J. Durkin. He was the defensive coordinator for the Wolverines last year, so he knows the potent Michigan defense well. A guy always wants to beat his old team. Durkin will likely be particularly motivated because the defense, which was strong last year, has been stronger without him so far. New Michigan DC Don Brown is very creative and will surely work extra hard to mix things up so that Durkin familiarity isn't a big advantage. The Michigan State game was in hand from the second quarter on, but it was more concerning than it probably should have been. The defense was still very good against the pass, but they were run on like they hadn't been all year. Maryland's pass offense is anemic, and they will struggle badly in this game. That will put extra pressure on the run. The Terps have a Top 20 running game, though, so being forced to focus on the run isn't a bad thing. This is the matchup that is most interesting in the game. Michigan has work to do, but they have been better against the run in other games, and they should be more prepared for this one. It's hard to see Maryland scoring a lot. You also need to factor in the mindset of the defense in this one. They were not happy with their showing last Saturday, and they have shown two key things this year - a strong ability to rebound and serious intensity. They will not want to feel substandard twice in a row, and a home game against a manageable opponent is a good spot to show that their mojo is fully intact. Maryland's run defense is a far bigger concern than Michigan's. They allowed 414 yards on the ground in their loss to Indiana last week. Michigan has been running the ball fairly well this year. What really stands out, though, is how balanced the action is. They have been using a wide range of backs and ball carriers, and each one offers something a little different. It has been an effective way to keep defenses off guard, and against a Maryland run defense that is already vulnerable this is a serious concern. The game opened with Michigan favored by 30.5, and it has stayed at that level in early action. Only a tiny majority of bets have been on Michigan, so we aren't likely to see a major swing in the number unless there is news. The Terps are 4-1 ATS in their last five following an ATS loss. They are 13-5 ATS in their last 18 games following a straight up loss and 7-3 ATS in their last 10 on field turf. The Wolverines are 5-1 ATS in their last six games following an ATS loss. They are 1-4 ATS in their last five home games against a team with a winning record. This is a whole lot of points to give up. Probably more than is smart. There is no choice but to pick Michigan, though. They are going to be playing angry because they didn't fully meet their standards despite the big rivalry win last week. They are at home and against a coach they know and want to deliver a message to. It's a big recruiting weekend, so they will be playing to impress, too. They match up well - especially on the ground against an outmatched Maryland defense. This is the kind of game in which Jim Harbaugh is going to want to send a message. Michigan is the pick. Doc's Sports wants you to try out one of their expert college football handicappers, and they are now offering new clients a free $60 in credit that they can use for any handicapper on Doc's Advisory Board. This takes less than two minutes to sign up, and there is no credit card needed and no salesmen to deal with. Get your free college football picks now.